The picture below shows not all bucks make it past Winter. A lot of big Whitetail Bucks die during the winter because of lack of food and their loss of body weight during the Rut. By the time the whitetail deer make it to the spring, they have made it through a winter of dealing with cold, snow, and the scarcity of food. Bucks have a hard time of it during the winter, especially since they are run down after going through the rut season. 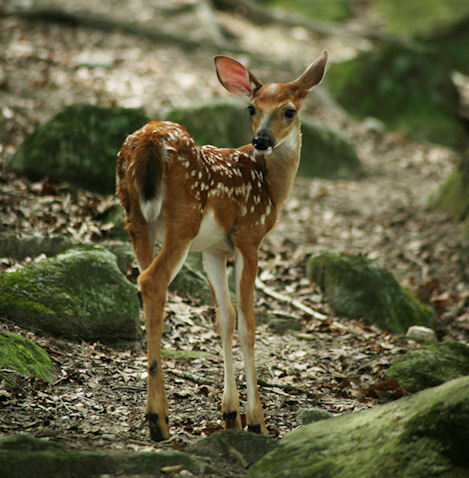 However, if they can make it to the spring, things will change and there will be a time of renewal for all the deer. So, let's take a look at some of the whitetail deer facts surrounding the whitetail deer buck during the spring. Once the snows begin to go away and the grass and other plant life begin to grow, once again the buck will be able to find the food that he needs. In many cases he may be quite frail by the end of the long winter, so this is the time to start building up his nutrition once again. Often before the snow even melts whitetail bucks will be able to find grass starting to grow beneath the snow or new leaves to eat on low hanging trees as they begin to bud in the spring. If the buck moved to a yarding area for the winter, they will begin to move back to the place that they came from, which can take a bit of time. Usually bucks will go back to the same territory that they came from, since they inhabit the same places for most of their lives. 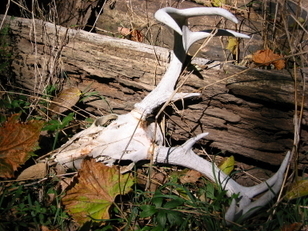 At this time a Whitetail Buck will lose his antlers or even before. They come off in the late winter as a rule but every rule has its exceptions. I have had them come off in late December and have also seen them on Whitetail Bucks in March. Often after the winter time, the spring will bring about some different social relations among the deer, especially the bucks. While many of the bucks may be okay, some of the dominant whitetail deer bucks may have died, been hit, or even shot during the winter time, which means that groups of bucks may not have a dominant buck anymore. While usually they are quite passive during the spring months, you'll still find that they find ways to come up with dominance within the group. There are a variety of different foods that the buck has to enjoy during the spring months. Many of the foods they are now able to eat are full of nutrients, which is a great change, compared to the sparse, nutrient depleted food that he was eating during the winter months. Eating all the great foods with the nutrients will help the buck to replenish the needed nutrients within his body once again. During the spring the buck also begins to get rid of his winter coat as well. Instead of the brownish gray coat that he had that was so thick for the winter; he begins molting and getting rid of this coat, which will be replaced with a sleeker reddish brown coat that looks wonderful. Although the spring is the time when the does are having their young, the whitetail deer bucks are not involved with this process in any way. They are not present for the birth and they do not help with raising the young. However, younger bucks that are still with their mothers may end up being driven away right before she has her new young for the spring. So, the spring season is definitely a time of a lot of change for the whitetail deer buck.